It's been 23 days since my surgery. I have 2.5 weeks left of leave. I can extend and flex my arm nearly 100% and the physical therapist says only one more week in the brace. I started strength training today. 3lb barbells, woo hoo!! It hurts, but feels good to finally put my biceps and triceps to some use. The doctor and physical therapist are amazed at my speedy recovery. I still get the stiffness in my hand and arm, but most the the electrical kind of pain and numbness is gone. I'll feel it like once or twice per day (instead of ~6 hours or more a day). 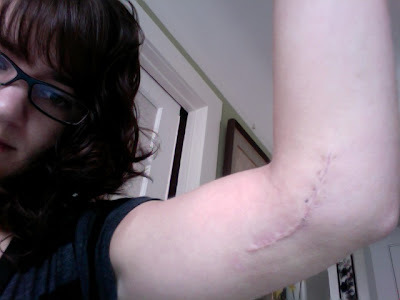 I did find out today that one of my (supposedly) internal stitches is peeking up out of my scar. So I'll have to get that pulled out manually in two weeks when I go back to the dr. It's totally freaking me out though. All in all, I'm still taking it slow, but things seem to be on the up!